If I talked to my cats about sustainability and clean meat for cats, they’d probably yawn and go back to sleep. For an animals who delight in stalking tiny rodents, compassionate eating is pretty much a nonstarter. But to a growing number of humans, including me, the cruelty involved in the production of our cats’ food is becoming a major concern. In an online survey, nearly 600 people said they’re interested in feeding their animal companions a plant-based diet, mainly because they’re concerned about farm animal welfare. The only thing that’s stopping them is the worry that a diet containing no animal protein will provide inadequate nutrition for their cats and dogs. Bond Pet Foods founder and CEO Rich Kelleman would probably brush off terms like test tube meat. Instead, he likes to compare producing clean meat for cats and dogs to craft brewing. That sounds like a bit of a stretch to me. But cats could care less about the origins of their food as long as it smells and tastes good. So there’s no yuck factor to overcome if you offer them meat grown in a lab. To make clean meat, manufacturers start with cells from a live animal. For Bond Pet Foods, the donor was a chicken named Inga, who contributed some cells and then went off to enjoy the rest of her day. The animal’s cells are fed to a microbe and left to ferment in a tank with a broth of vitamins, sugars and minerals. 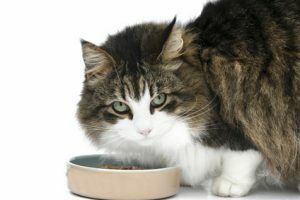 To make the protein into pet food, it’s mixed and cooked with other natural ingredients. Bond will be launching its first product — dog treats — sometime this year. Cat food will be coming later. Bond won a Purina Pet Care Innovation prize at last month’s Global Pet Expo. But when it awarded the prize, Purina might have been thinking as much about the planet as the plight of farm animals. Our animal companions and the food they eat are among the largest contributors to greenhouse gases. In 2017, pet food manufacturers bought over 16.5 billion pounds of meat, poultry, fish and grains to feed our cats and dogs. To make pet food more sustainable, manufacturers are experimenting with using black fly larvae and crickets as protein sources. And Purina recently launched RootLab, which uses cricket powder, invasive fish species like Asian carp, chicken organs that are usually discarded and cod meat that’s typically wasted during processing as ingredients in dry dog food. To me, this sounds like byproducts revisited. And much as I care about the farm animals (actually, I care about the fish and insects, too), I don’t think I could force myself to open cans of cricket powder and unwanted chicken organs for my cats. But food made from animal cells instead of slaughtered animals would definitely work for me, if I could convince my cats to eat it. Because Animals is also working on clean meat cat and dog food. The company’s first project is cat treats that start with mouse cells. The cats should love those! Companies developing clean meat for humans include Memphis Meats and Just, the makers of vegan mayo, creamy salad dressings and Just Egg.